He added she'd been seeing a doctor and was taking medication for depression. Kate Spade's apparent suicide on Tuesday shocked the fashion community and her countless fans, but the designer's husband and business partner, Andy Spade, told The New York Times that perhaps nobody was more stunned than those who knew her best. Andy Spade told the newspaper that although he and his wife of more than two decades had unofficially separated last year, they had no plans to divorce, and kept apartments just a few blocks from each other, where they were co-parenting their 13-year-old daughter, Bea. He also said that although his partner of 35 years suffered from depression and anxiety, she'd been seeing a doctor regularly and was taking medication to combat the conditions. Contrary to reports, he added, there were no substance abuse issues, nor were there business problems. "We were in touch with her the night before and she sounded happy. There was no indication and no warning that she would do this," he told the newspaper. "It was a complete shock. And it clearly wasn’t her. There were personal demons she was battling." The 55-year-old fashion designer, who became best known for her eponymous line, was found dead in her Manhattan apartment Tuesday morning. She started the Kate Spade line with her husband in 1993 and she eventually sold all her shares in the company in 2006. She launched a new line in 2016 called Frances Valentine. In the wake of the designer's death, Kate Spade's older sister, Reta Saffo, told The Kansas City Star via email that the apparent suicide was "not unexpected," adding that Kate Spade suffered from mental illness. Saffo added that she'd helped her sister get in-patient hospitalization treatments "several times in the past 3-4 years" and "felt all the stress/pressure of her brand (KS) may have flipped the switch where she eventually became full-on manic depressive." Earl Brosnahan, Kate Spade's older brother, told The New York Times, however, that Saffo has been estranged from their family for more than 10 years and said that Kate Spade was the only one of the six siblings to speak to her, albeit sporadically. He characterized Saffo's statements as "grossly inaccurate," and Andy Spade noted that anything that contradicted what he said was "false." Brosnahan, who was aware of Kate Spade's depression and marital separation and believed the two may have been linked, said that just last week, he had dinner with his designer-sister. "She was still talking very much about the future," he noted. Added her longtime friend, Elyce Aarons: “Katy was very happy most of the time, the funniest person in the world, and sometimes she would get really sad." David Spade, 53, talked about "Katy" in posts on social media in the wake of her apparent suicide. 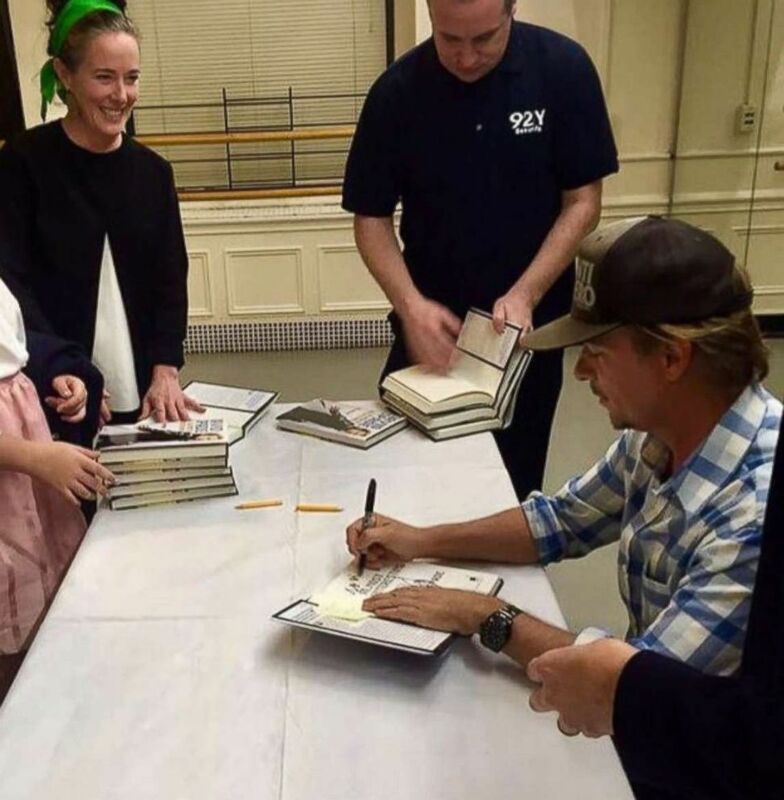 The first post came on Twitter, where he shared an undated picture of her visiting him during a book-signing, where she is seen smiling while looking at him and wearing what appears to be a green ribbon as a headband. "Katy at my book signing. I love this pic of her. So pretty. I don't think everyone knew how f------ funny she was... Its a rough world out there people. Try to hang on," he wrote in the post. (David Spade/Twitter) David Spade posted a photo of Kate Spade on Twitter, June 5, 2018. Shortly after, he posted a picture on Instagram of him with his sister-in-law from an undated Christmas gathering. "Fuzzy picture but i love it. Kate and I during Christmas family photos. We had so much fun that day. She was so sharp and quick on her feet. She could make me laugh so hard. I still cant believe it. Its a rough world out there people, try to hang on," he wrote. Rachel Brosnahan also shared a photo of her aunt, stating that "this is how she would want to be remembered." "She had a light that words can’t capture but touched everyone she came into contact with. She was exceedingly kind, beautifully sensitive, insanely talented, funny as heck and one of the most generous people I have ever known. She was effervescent. Hug your loved ones extra tight today," Brosnahan wrote. Lesley Messer contributed to this report.